I want to share with you an approach that is based on using R.Execute() in Power Query, and has the advantage of not implying a dependency outside the Power BI environment. This is a re-iteration of a pattern that I’ve already mentioned in one of my previous posts, which explained hot to use R to get STDOUT as a data source in Power Query. In the R script I use, the function system2() executes system commands tasklist and netstat. Because I need to output the results of these commands into data frames, I also use the function read.fwf() in order to parse the fixed delimited output of STDOUT. Microsoft.Mashup.Evaluator.Interface.ErrorException: Connections to the server context that is currently active are not supported. Which is not very practical. I rarely use R in Power BI, but when I do, I make sure to keep the data mashup out of it. I don’t have anything against R, it’s arguably the best statistical tool out there, however when it comes to using an expressive language for doing data wrangling, Power Query (M) is my language of choice. Although R has been introduced to Power BI ecosystem as a complimentary tool, its capabilities exceed by far those of the Microsoft’s analytics suite. That is why in areas where Power BI is falling behind, I can always rely on R to bridge the gap. Below I describe 5 patterns of how I use R.Execute() in Power Query. I have divided these in 2 classes – as intended and unintended use cases – just to separate the expectation for how much support these patterns will be getting from Power BI team. Note: When using R.Execute() the only rule I follow is that if I need some data out of an R routine, I must put the execution results into a dataframe. Other than that all R rules apply. This is probably one of the most legit use-cases for using R in Power BI. Because there is no language/framework/library that can compare to the vast variety of algorithms implemented in R. If you need to run some exotic algorithm on your data, most likely there is an optimised version written an R, you just have to find the right package (and the right repository: CRAN or MRAN to name a few). Here is a standard R call executing KMeans clustering on iris datataset. Regex is the perfect example here. While we wait for its implementation to arrive in Power Query, why not use R regex related functions regexpr, regmatches, etc? Here is an example for parsing @mentions and #tags from a twitter feed. Or another cheeky example of trying to salvage removed passwords from GitHub commits. My favorite ones of the lot. I must admit these are the patterns that I abuse the most. Say you have some CSV data stored in a ZIP file on your file system somewhere, the only way to get a hold of that data is either by manually unzipping the data, or use one of the lovely UnZip functions written in Power Query by either KenR or Mark White. The R way is even simpler, use read.csv(unz(zip,file.csv)) and you’re done! 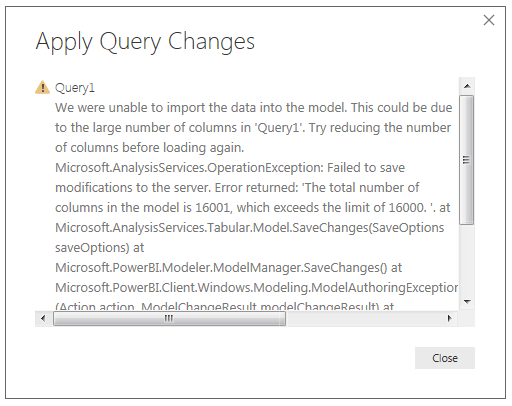 You’ve done your data analysts in Power Query and you’re stuck with all this data in the $Embedded$ Tabular Data Model. The only way to get the data out is by exporting this data via a table chart, into a CSV. On the other hand you can use R, and export effortlessly millions of records via write.csv function and not worry about rendering problems that might be caused by the table chart visualisation. This pattern was inspired by one of the questions from the Power BI community. Again, referring back to R, you can call a system commands via system2() function and use its console output as a data source in Power Query. Although matrices are not first class citizens in Power Query, quite often a business problem comes along which might greatly be simplified by thinking of it in matrix terms. You can of course imitate matrices in Power BI by means of tables, two dimensional lists or records but this approach doesn’t come with any matrix related functions. So as always you have to roll up your sleeves and roll out your own set of needed operations. I would like to share with you an approach of doing matrix multiplication which can be translated into other algebra operations. We’ll start by reviewing how matrix multiplication works from the diagram below. If we break down the problem, we can think of two matrices A and B, in M(Power Query) terms as two tables with matching size of rows in matrix A and columns in matrix B respectively. Then the matrix multiplication operation can be reduced to a problem of iterating through all row and column combinations and computing the dot product of equally sized vectors. The dot product in M can be performed by using List.Accumulate which aggregates the product of a List.Zip which in turn pulls the respective elements of two vectors into a tuples. Here is the code. Next, we breakdown the matrix A into rows – Table.ToRows(A) – and matrix B into columns Table.ToColumns(B). And iterate through all the combinations of row vectors and column vectors in order to accumulate the results into a nested list of dot products. Check the code below for use of nested List.Accumulate. I’ve heard this question being asked multiple times, in forums, blog posts and every single client that doesn’t trust the performance of the Power BI desktop app. I’ve set myself the challenge to finding this out, while exploring the versatility of Power Query M language. One of the most powerful data structures that M has in its arsenal is the List. I’ll start by creating a simple list of numbers. Let’s Apply this query and check the result in the Data Model. This list looks like a table, acts like a table – then it must be a table. While I’m here I’ll change the Data Type of the column Query1 from Text to Whole Number. This way I’ll save the memory footprint for next time I try to load as much data as possible in in this single column table. Next step – construct the biggest list possible. And I’ve hit my first limit. Another try with 231-1. Success! But not for long, as once I apply the changes and wait for the Query Changes to be committed to Data Model, at around 2,000,707,684 loaded records I was faced with another error. I’ve tried to repeat the process with a smaller lists and got my first success at 1,999,999,981 records. Which produced a 29GB file. That’s a lot of records, and only to add them to the Data Model I needed 55GB of memory. Not too bad for a desktop application. What about if I wanted to load lots of data that is not that unique? Say 232-2 of ones? This query completed in no-time, and with very little memory footprint as the entire msmdsrv.exe service stayed within the 1GB limit. The output saved on disk occupied 191KB. Go compression! How about the wideness of data? I used a different set of queries to find the limit. Which resulted in a 167MB file.